G. Manenti, V. Pescuma and S. Sarti, Alfa Laval Olmi Spa, Italy, provide an overview of the delivery schedule for a key piece of heat transfer equipment, process gas boiler packages, to fertilizer plants. Process gas boiler (PGB) packages are heat transfer equipment where process gases are cooled by means of water vaporisation. They consist of a boiler and a steam drum as a minimum, but other heat exchangers are frequently included. Major PGB packages, in terms of dimensions and technology, are installed in ammonia plants. Depending on heat recovery philosophy and process licensor technology, a complex ammonia PGB package constitutes several items, such as a reforming boiler, shift conversion boiler, ammonia synthesis boiler, steam drum, boiler water preheater and steam superheater. Figure 1 is a typical outline drawing of a complex package. For large-scale ammonia plants (>1600 tpd), where optimisation of the heat recovery scheme is essential, PGB packages have complex layouts and significant dimensions; they may produce up to 200 tph of steam. Water-side of ammonia PGB packages works normally at a high pressure (>10 MPa); process gas is at a high temperature and pressure and may also have a corrosive action on construction steels. For instance, hot reforming and ammonia synthesis gases are at approximately 1000˚C and 3.5 MPa(a), and at 430˚C and 20 MPa(a), respectively. Accordingly, ammonia PGB packages are installed on main process stream and work under critical operating conditions. This makes their operating and mechanical reliability a key parameter for plant OPEX. The ammonia PGB package complexity is also due to other specific features. The PGB, steam drum and other exchangers are interconnected by means of a large set of water and steam piping – where this layout is often tortuous. Moreover, the steam drum is usually supported by the piping itself, instead of an independent structure, and boilers/exchangers can be subjected to loads and movements along more than one direction. This makes structural design and site assembly challenging. When the process gas temperature is above 450 – 500˚C, such as in the reforming PGB, pressure parts containing the gas are lined with refractory, which must be engineered and installed by specialised sub-suppliers. Furthermore, since a significant portion of construction materials is made of high-nickel alloys, first-class manufacturing quality and capabilities are necessary. Finally, according to process licensor operating criteria, ammonia PGB packages may require special devices for finely controlling the heat transfer performance. 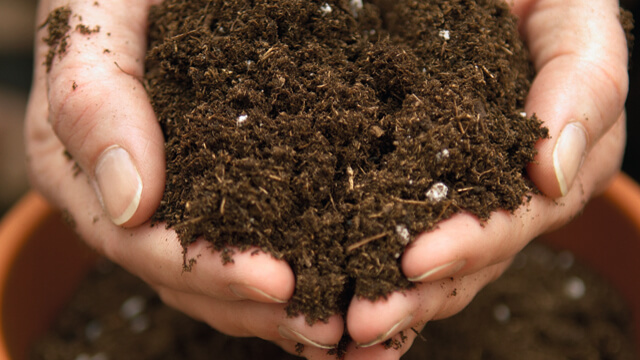 Due to the relevance of PGB packages in engineering, procurement and construction of fertilizer plants, this article reports a short review of a typical delivery schedule for a large package, from design to site assembly, as per supplier’s experience. Representative milestones and potential issues are highlighted. PGB packages for ammonia plants represent one of the most critical items for plant CAPEX and delivery schedule. As a consequence, package scheduling and supply progress are always subjected to a tight survey by contractors and final-users. Ammonia PGB packages are usually considered as long lead items by contractors; a package can take 13 – 15 months from purchase order for delivering single items. On the other hand, due to the size equipment, pre-assembly at a supplier’s workshop is impractical. Transport dimensions (W x H x L) of reforming boiler and steam drum can reach, for instance, 3200 x 3000 x 14000 mm and 3200 x 3500 x 14000 mm, with a dry weight ranging from 80 – 130 t.
1 set of interconnecting piping. These three phases generally represent the scope of supply and work of the PGB package supplier. Figure 2. 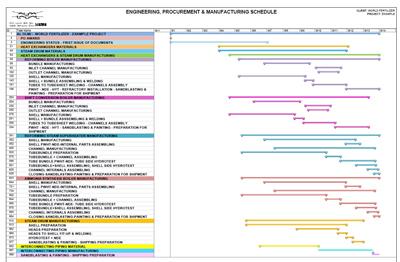 Engineering, procurement and manufacturing schedule. Engineering takes approximately six months. During this period, both standard heat exchangers and specific PGB package documents are prepared and issued to the client. Within the standard documentation are datasheets, drawings, coded mechanical calculations, project management documents, manufacturing procedures, non-destructive tests procedures, quality control and inspection plans. As for specific documentation, there are thermal-hydraulics calculations, refractory procedures, thermal-mechanical and structural finite element analysis, valves and instruments requisitions, and supports requisitions. Last but not least, a relevant portion of the engineering timescale is dedicated to issuing manuals and procedures for site assembly, commissioning, operations and maintenance of the package. 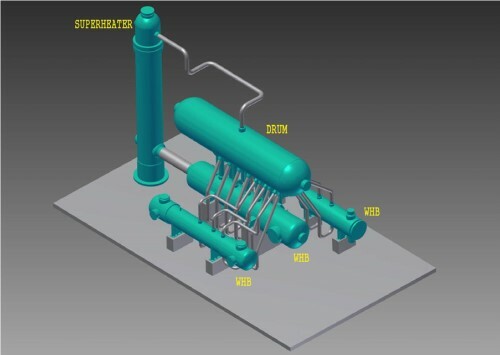 Often, client project specifications and specialists refer to standard shell-and-tubes exchangers engineering, which is difficult to be fully applied to a complex package constituted of special and proprietary technology items. As a result, strong discussions between clients and suppliers may arise about few or, even, minor design details. To avoid such expensive incomprehension, either several portions are removed from project specifications during the bidding phase or, more reasonably, clients adopt a general approach to accept the supplier’s tailor-made design. Actually, for ammonia PGB packages, only specifications from process licensors should be considered as fully mandatory. During the bidding phase and first months of the job, supporting and auxiliary structures are often not yet finalised. For instance, staircases/platforms/ladders around the steam drum should be finalised after the general layout of the package has been agreed; yet, civil activities must be defined as soon as possible. 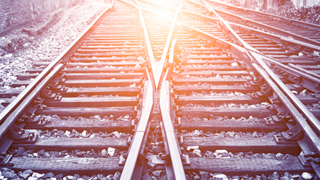 This frequently creates priority issues that are difficult to resolve. In the worst case, this may have a big impact on the interconnecting piping and the equipment nozzles layout. Each ammonia PGB package has an optimised and tailor-made design, and therefore assembly and commissioning activities at a site are comparable from one plant to the other, but never identical. As a consequence, when unexpected assembly and commissioning issues occur (usually in an advanced phase of the job – if not directly at the site), the package design may undergo expensive changes in terms of time and cost. Several metallurgical grades and types (tubes, plates, forgings) must be procured. Materials have significantly different delivery times and prices. Expensive materials (alloys) suffer from price volatility and have long delivery times. Pressure components have large thicknesses so no stock materials can be considered. Plates and forgings have large formats, which only a few mills can supply. Special forgings, with complex shapes, are often required. Construction materials are costly and, as shown in Figure 2, can take up to eight months for delivery. Consequently, any design change or issue along the job may have a large impact on materials procurement. On the other hand, to assure a proper delivery time of the package, sub orders for long delivery materials must be placed with sub-suppliers at least 2 – 2.5 months after the purchase order. To be compliant with this constraint, engineering must issue general and detailed drawings within approximately 6 – 8 weeks to have a first approval from the client before any procurement. Manufacturing of shell and channel(s). Manufacturing of bundle (including exchanging tubes to tubesheet welding). Bundle and shell, or bundle and channel(s), assembly. Finishing (post-weld-heat-treatment, hydrostatic tests, refractory installation, sandblasting, etc.). Each of these operations includes tens of sub-operations, which must be done according to a specific and rigid sequence, mainly based on the manufacturer’s experience. Pre-heating, welding and cooling of large thick components made of enhanced carbon steels or low-alloy steels with 2.5Cr or more. Buttering, weld overlay and cladding. Last but not least, installation of refractory materials, carried out by proven sub-suppliers, represents a key operation since improper quality of refractory lining often causes expensive and annoying problems at a site during operations. As can be noted from Figure 2, manufacturing takes approximately nine months and overlaps with engineering and materials procurement; this is a potential source of severe issues, intrinsic to the high-level product, which can only be faced with proper expertise. Figure 3. 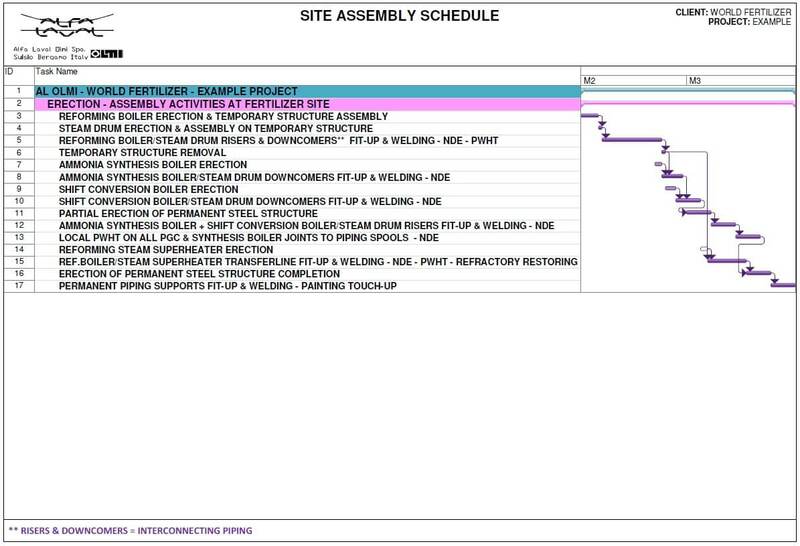 Site assembly schedule. Assembly of the steam drum on top of the reforming boiler: this requires a special and heavy temporary structure since the supporting piping is installed once the equipment is in place. Alignment of items: these have significant dimensions and weight and, chiefly, have interconnecting nozzles of large size and thickness. Assembly of piping, which usually have a tortuous routing. Analysis of site activities must be done between the supplier and the client as early as possible during the project, since site assembly problems may be disastrous in terms of cost and time. Alignment templates, transport and lifting equipment, welding materials and tools, non-destructive examinations, spare parts, and finishing are key topics to be well defined before the equipment has left the workshop. A trouble-free complete mechanical assembly, with skilled fitters and welders, usually takes a minimum of two months. 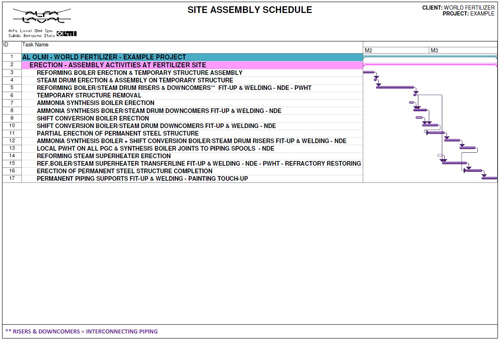 The article is a short review of a typical delivery schedule for a large ammonia PGB package. The schedule includes engineering, materials procurement, items manufacturing and site package assembly. It is highlighted that due to special technology, tailor-made design and the large dimensions of items, critical delivery issues may arise along the job and heavily impact on the final supply. Delivery of such complex and skilled packages must be based particularly on a friendly and accurate cooperation between suppliers and clients/contractors.